Ultra HD Optics with the ATN Revolutionary Ultra HD Day/Night Sensor gives you an incredibly crisp picture from any distance. Day or Night, Record video, Built in rangefinder, Ballistic Calculator, Dual stream video records video to SD card while also streaming, Recoil activated video (recoil triggered) - will take a video of before, during and after your shot has been fired. Magnification: 3-14X Field of View at 1000 yds: 460ft 9 degrees Sensor: ATN 4K M265 Sensor, 3864 (H) x 2218 (V)..
Ultra HD Optics with the ATN Revolutionary Ultra HD Day/Night Sensor gives you an incredibly crisp picture from any distance. Day or Night, Record video, Built in rangefinder, Ballistic Calculator, Dual stream video records video to SD card while also streaming, Recoil activated video (recoil triggered) - will take a video of before, during and after your shot has been fired. Magnification: 5/20X Field of View at 1000 yds: 240ft 5 degrees Sensor: ATN 4K M265 Sensor, 3864 (H) x 2218 (V).. This is not your last years Viper. The Gen II has upgraded features inside and out. The illumination dial is integrated into the side focus knob. The turrets feature the RZR (Rapid Zero Return) mechanism for fast and precise return to zero. The turret can be quickly returned to zero without counting clicks. 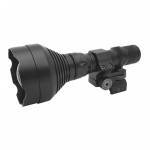 Magnification 1-6 x Objective Lens Diameter 24 mm Eye Relief 3.8 inches Field of View 112.5 - 18.8 feet/100 yards Tube Size 30 mm Turret Style Capped Adjus..
ATN IR850 Supernova; an extremely powerful, longrange infra-red illuminator with adjustable mount, that is perfect for hunting, law enforcement, search and rescue and military use. 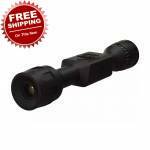 This long range IR flashlight features 4 modes of operation: 90/660/1540/2200 mW. Aircraft Aluminum Waterproof Lithium Ion Rechargeable Battery LED Bulb Head Diameter 2.76" Weight 11.8oz .. Built to withstand the pressure from high caliber weapons, the Thor LT is made from hardened aluminum alloy and is built for high caliber recoil. The streamlined design of this scope looks more like your traditional glass optic and gives the user a choice of mounting with any 30mm rings. No need to burn through boxes of ammo just to get your thermal scope to zero. With one shot zero, all you have to do is move the zero reticle to your first point of impact. That’s it. 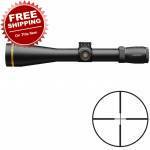 Saving you a ton of time, m..
BSA Optics Sweet 22 Series 6-18x40 .22LR Rifle Scope. Calibrated for the .22LR. Adjustable Parallax. 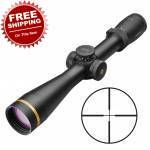 Magnification: 6-18 Lens Diameter: 40mm Field of View @ 100yds: 16.6-4.8 Optimum Eye Relief: 4" Parallax Setting: 10 to infinity Click Adjustment Value: 1/4 Weight: 17.6oz .. The VX-3i delivers what hunters want most in a riflescope: outstanding performance in low light, in an incredibly tough yet lightweight package. With the Twilight Max Light Management System you’ll be able to see more game and pick out amazing detail during those crucial first and last minutes of daylight. We also gave it match-grade repeatability and ergonomic controls that are easy to read and use, even with gloves. Everything we put into your VX-3i is there to help you tag out. 1/4 M..
Let the VX-3i 4.5-14x40 help you reach out further without adding ounces. With a magnification range that’s great for any situation, you’re guaranteed to have the right tool for the job. And with a 30mm maintube, get the extra adjustment you need to make that long-range shot. What do hunters want most in a scope? Plain and simple; outstanding performance in low-light conditions and an incredibly tough, lightweight design. The VX-3i delivers this and more. Our Twilight Max Light Management System.. The VX-3i delivers what hunters want most in a riflescope: outstanding performance in low light, in an incredibly tough yet lightweight package. With the Twilight Max Light Management System you’ll be able to see more game and pick out amazing detail during those crucial first and last minutes of daylight. We also gave it match-grade repeatability and ergonomic controls that are easy to read and use, even with gloves. Everything we put into your VX-3i is there to help you tag out. 2nd G..
Let there be light! VX-5HD 3-15x56 gives you all of the flexibility of its 44mm counterpart, but with the 56mm objective bell, it maximizes as much exit pupil light as your eye can handle. From the mountains, to the open plains, to range day, this scope has the ability to dominate them all. The VX-5HD has everything you need and nothing you don’t. Leupold’s Guard-ion lens coating shed water and dirt, keeping your target clear even when the weather isn’t, while Leupold’s Twilight Max HD light .. This scope is made for anything and everything. Its 3-15 magnification range lets you take full advantage of any situation. Crank the power down to three for thick timber hunting, ratchet it up to 15 for your trek across the open plains, or go anywhere in-between during your range days. The VX-5HD 3-15x44 has the versatility to dominate them all. The VX-5HD has everything you need and nothing you don’t. Leupold’s Guard-ion lens coating shed water and dirt, keeping your target clear even when the.. 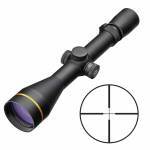 When the distances increase, increase your chances of a hit with VX-3i LRP 6.5-20x50. 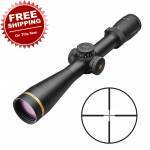 It has the right magnification and elite optical performance to get you on target quicker and more accurately. The name says it all – Long Range Precision (LRP). 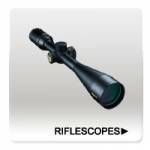 This scope is purpose built with match-grade accuracy and repeatability. Choose between first or second focal planes, MOA or MIL adjustments, and several magnification options. With easy-to-read adjustment dials and an integrated, quick-turn throw leve.. The VX-3i Long Range Precision riflescope delivers the lightweight performance long-range hunters and shooters demand. You get match-grade accuracy and repeatability, your choice of first or second focal plane reticles, and adjustments in MOA or Mils. Get behind the scope, and you’ll discover it’s made for shooting. The dials are easy to adjust and read from any shooting position. The throw lever is fast, smooth, and easy to use with gloved hands. Push your limits with a VX-3i LRP. 30mm.. The VX®-3i Long Range Precision riflescope delivers the lightweight performance long-range hunters and shooters demand. You get match-grade accuracy and repeatability, your choice of first or second focal plane reticles, and adjustments in MOA or Mils. Get behind the scope, and you’ll discover it’s made for shooting. The dials are easy to adjust and read from any shooting position. The throw lever is fast, smooth, and easy to use with gloved hands. Push your limits with a VX-3i LRP. 30m.. This scope is made for anything and everything. Its 3-15 magnification range lets you take full advantage of any situation. Crank the power down to three for thick timber hunting, ratchet it up to 15 for your trek across the open plains, or go anywhere in-between during your range days. The VX-5HD 3-15x44 has the versatility to dominate them all. The VX-5HD has everything you need and nothing you don’t. Leupold’s Guard-ion lens coating shed water and dirt, keeping your target clear even when .. The AR specific model of our VX-Freedom delivers the features you need to get the most out of your .223/.556 or .308 on the range or in competition. The 1.5-4 model provides a wide field-of-view, while also allowing for precise, mid-range shots. The new VX-Freedom delivers the legendary Leupold performance and dependability hunters and shooters have demanded for decades, combined with a host of new and improved features. The VX-Freedom is guaranteed to get the job done every time. Easy to.. The new VX-Freedom delivers the legendary Leupold performance and dependability hunters and shooters have demanded for decades, combined with a host of new and improved features. The VX-Freedom is guaranteed to get the job done every time. 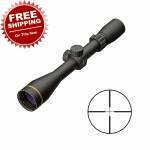 Punisher Tested (5000 impacts on Punisher recoil machine) 1 inch Maintube 1/4 MOA Finger Click Adjustment Eye Relief 3.66 - 4.17 in Weight 12.20 oz ..